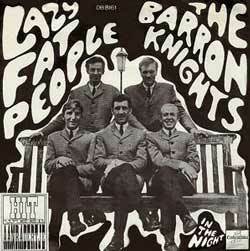 The Barron Knights formed in Leighton Buzzard during 1959. They started out as a straight music group, calling themselves the Knights Of The Round Table. They first appeared at the California Ballroom on the 12th August 1960, making regular visits thereafter. Their first taste of fame came in 1963 when Brian Epstein asked them to become one of the support acts on The Beatles' Christmas shows at Finsbury Park Astoria in London. Later, they toured with both The Beatles and The Rolling Stones. Chart success didn't come until the summer of 1964 when "Call Up The Groups" reached Number 3 in the UK charts. Being local lads (Duke lived half a mile away in Bull Pond Lane, Dunstable) the Barron Knights always had a terrific time at the California Ballroom - we used to work it around once every 6 weeks if I remember rightly. I'll have a chat to Pete & Duke and put some stuff together for you about it. I do remember working there with Russ Sainty (Roger Dean is a very old friend of mine, we met when we were working in London, me for an Engineering magazine while he worked for a furniture company. 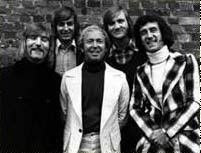 We used to go down to a small club called the Bread Basket around 1959/60) The Checkmates, Alan Hawkshaw became a great friend of ours, Dusty Springfield and I'll get a few more names from the lads. One wee story; we had a drummer then called Sharkey, he used to sing a jazzy song (can't remember which) and I'd back him on the banjo. My Dad taught me to play banjo when I was around 8-10 years old and I'd asked him if I could borrow it to use on stage. It was, and still is, a super instrument and it was very precious to the old man. 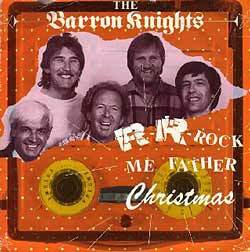 Anyhow, I'd forgotten to get it out of the old coach (see Barron Knights Official website http://www.barronknights.com) so during the number before it was to be used I asked Barron to go to the bus and get the banjo. He shot out, unlocked the padlock and pulled back the sliding door of the coach, got out the banjo and put it on the ground behind him to shut the door, at which point a car ran over it. He brought the whole mess onto the stage. The case was smashed to pieces and there was a tyre mark up the length of it. I opened the case with shaking hands and it fell to bits - took out the banjo and to my surprise it was completely unmarked, even still in tune. I darn't tell the old man so I went to London, and bought a brand new hand-made case for it. The next time I saw the old man I said "Dad, thanks for lending me the banjo, I bought you a new case for it!" He never found out.